The New Labour project has dominated British politics in the same way that Margaret Thatcher dominated her times. Unlike Thatcherism, however, and with the exception of the war on terror, Blairism will be remembered for winning elections rather than transforming Britain. Mr Williams identified Tony Blair’s “chameleon capacity for endless reinvention”. The fact that he stands “centre-stage amid the ruins of the culture of political parties”. This conservativehome.com definition takes each of these observations in turn. 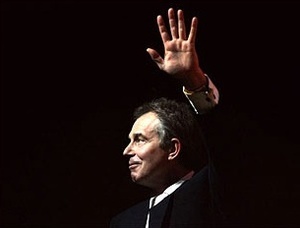 Tony Blair’s capacity for reinvention has produced a mess of contradictions. His ability to confuse the electorate was summed up by the front cover of an April 2001 edition of The Economist. 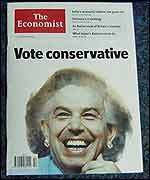 Tony Blair is shown sporting a Thatcher hairstyle, underneath a “Vote conservative’ caption. At the heart of Tony Blair’s chameleon politics is the art of triangulation. But if triangulation, his defining political technique, was imported from Bill Clinton, his defining mission has been his support for George W Bush’s neoconservative war on Iraq. If his first term was dogged with accusations that he listened too slavishly to opinion pollsters, ‘second term Tony’ has been dogged by accusations that he has been deaf to public opposition to the Iraq campaign. The war on terror may have marked out his second term but the mass release of convicted IRA terrorists was one of the major characteristics of his first term appeasement process. The man who vowed not to raise income tax has presided over a government that has raised taxes at least 66 times. The model husband and father that we see on Downing Street Christmas cards has abolished the last recognition of marriage in the tax system. He’s the wannabe Catholic who votes for abortion and euthanasia – in contradiction of fundamental Catholic social teachings. The politician who promised “whiter than white” government has been dogged by scandals and accusations of cronyism from day one. The Eccelestone affair, Mittalgate, the Hinduja brothers, using 9/11 to bury bad news, Geoffrey Robinson’s offshore trusts, Blunkett’s nannygate furore, the smearing of Paddington train crash survivors…. The list is a long one. The “nice” Mr Blair has also employed some of the most brutal of political operators – not least Alistair Campbell and Peter Mandelson. The contradictions produced by his reinventions have caught up with him. Conservatives who once warmed to his religiosity and talk of duty (like Paul Johnson) have given up on him. Many ‘old lefties’ have also deserted him and now come together as anti-war protestors and to support rebellions on tuition fees and foundation hospitals. Tony Blair continues to do well at elections because his political tentacles still reach into huge areas of political space that Tories once monopolised as their birthright. At the height of his powers he was talking about the importance of two parent families, his love of the pound and he was using the Conservative Party’s ‘one nation’ language. It was devastating for the Tories who had no safe ground upon which they could demonstrate distinctiveness. Mr Blair refused to be bound by old ideological boundaries. The only things that matter are those that work, he declared. Any good ideas were quickly adopted by his neophiliac Labour project. The Tories were left with the small consolation of governing by proxy. "Politics in the 20th century was characterised as a choice between the Conservatives representing economic prosperity and Labour representing social justice; between the Tories being tough on criminals while we were tough on the causes of crime. Time and again the Tories won because this divide favoured them. People voted for them because, while their hearts might have been with us, their heads weren't. New Labour crosses this political divide. We have shown that we can combine social justice and economic efficiency and are demonstrating that we can tackle crime and its causes." This electorally brilliant positioning has not produced good government, however. Tony Blair’s centrism has been of the milk-and-water, split-the-difference variety. His centrism has been weak, not strong. He has not, for example, cut taxes for those on the minimum wage – therefore simultaneously embracing a ‘right-of-centre’ belief in tax relief with a ‘left-wing’ commitment to social justice. Instead he has found half-way positions between old opposites. He hasn’t raised income tax in the Old Labour ‘make-the-pips-squeak’ way but he has introduced many harmful stealth taxes. His regulatory agenda, may not have undone the Thatcherite reforms but they have produced miles of red tape that are pulling Britain further away from the the supply-side flexibility of hi-growth America. In contrast Arnold Schwarzenegger has pursued a ‘strong centrism’. The California Governor’s muscular middle agenda offers a superior way of transcending the outdated left-right axis. The ‘And theory of conservatism’ is this website’s suggested way forward. It suggests that bolder policies on ‘core’ conservative concerns will be ’permitted’ by voters if conservatives also embrace ‘good for my neighbour’ and similar ’breadth’ issues. The third ingredient of Tony Blair’s New Labour worldview has been the way he dresses everything in ethical language. Tony Blair understands the power of ‘good intentions liberalism’. He knows that many people will forgive delays in delivery – even failures of delivery – if the government wants the right things. Tony Blair also understands the importance of not overdoing the moralising. Hywel Williams’ description of a light ethical dusting is 100% accurate. 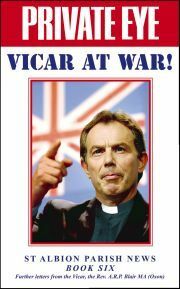 Mr Blair and his advisers have become very sensitive to Private Eye’s caricature of him as the Vicar of St Albion. Gone are ‘early Blair days’ photo opportunities where snappers were invited into church to photograph Tony Blair at worship. Alistair Campbell, as Director of Downing Street Communications, was particularly sensitive and once told a Spectator journalist that the Blair Downing Street didn’t “do God”. But if the confessional Blair is now in the background the missionary Blair is still much in evidence. 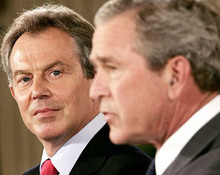 Covenantal language – once used to promote a domestic programme for a “New Britain”– is now in evidence on the international stage as Tony Blair “vows” to ‘make poverty history’ and continues to prosecute the war on terror. Margaret Thatcher and Tony Blair have been British politics’ dominant figures over the last twenty-five years. Tony Blair has often appeared to relish the comparison and, soon after he was first elected, he invited Margaret Thatcher for tea in Downing Street. But whilst both are charismatic personalities and both are proven election winners the comparison flatters the New Labour man. Neil Kinnock did the hard work of transforming the Labour Party before Tony Blair ascending to the Labour throne. The party was desperate for victory when Tony Blair succeeded the late John Smith and he was able to further modernise the party without internal disquiet. In his first term he never undertook bold reforms – with the possible exception of granting independence to the Bank of England (a process already underway because of Ken Clarke’s 1999 reforms). The only time Tony Blair has ever acted courageously has been in the war on terror. There he has, rightly, stood tall alongside George W Bush. The American conservatives who adore Tony Blair should take a look at his domestic agenda, however. Although Tony Blair has not introduced catastrophic reforms he has produced a more highly taxed, highly regulated and politicised Britain. But it his goal of submerging Britain within a European superstate that should really worry them. The special US-UK relationship will weaken as Britain gets more wrapped up in Brussels’ lowest common denominator foreign policy. It is possible that You Also Make All these Blunders With bag ?